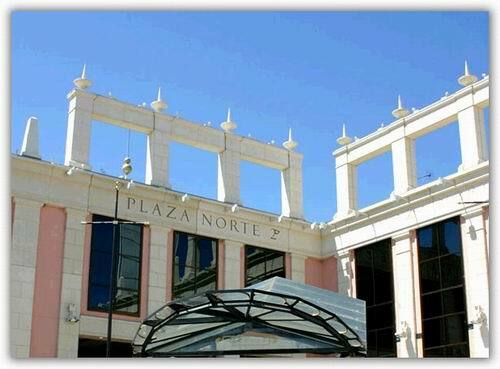 Plaza Norte 2 shopping centre is one of the largest shopping malls in Madrid, located in San Sebastian de los Reyes, to the north of the city. The enchanting interior has the feel of an 18th century palace to it, with the exterior of the building being just as spectacular. It boasts Venetian-style lighting in the form of lamps and large chandeliers, marble floors, columns, staircases and balconies, as well as exquisite lapis lazuli obelisks. The effect is an intriguing mix of present-day modern technology combined with the gracious elegance of past eras. The aesthetic appeal made to the visitor's senses is equalled only by the clear intention to provide comfort, convenience and pleasure. For couples in love, it's the perfect place to combine romance with the practicalities of life! Chapman Taylor, the centre's architects, won the prestigious 'Architect of the Year Award' at the 5th Central & Eastern European Real Estate Quality Awards held in 2008. This event is a showcase of talent in the real estate sector for Central and Eastern Europe, with La Cúpula de Madrid being a fine example of the innovative vision and sophisticated style of this architectural firm. 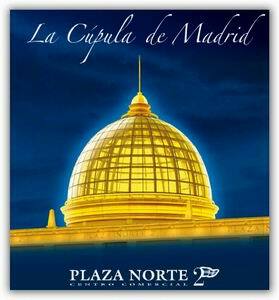 This shopping centre is affectionately known as La Cúpula de Madrid (Madrid's Dome) because of the spectacular 35-metre high dome located above the centre of the building. Any shopping mall (centro comercial) in Madrid is a popular meeting place for families and friends planning an excursion that is guaranteed to include good company, relaxation and recreation. Plaza Norte 2 does not disappoint; it offers visitors a very satisfying 200 stores, 25 restaurants or cafés, and 14 cinemas for their enjoyment. All tastes and budgets are catered for, with the centre boasting both familiar Spanish stores and international brand name retail outlets. New shops such as Membur, Amichi, New Yorker and Kevinston Patagonia Style have recently opened their doors at Plaza Norte 2. When your desire for a little retail therapy has been satisfied, it's time for a leisurely meal or taking in that movie you've always wanted to see. Certain entertainment opportunities at the centre vary, such as the FNAC agenda offered by Club Cultura, so it's worth finding out what temporary events or exhibitions are being advertised at the time you'll be visiting. The retail outlets open daily from 10am-10pm. Leisure area hours Sunday to Thursday are from 10am-1.30am, with Fridays and Saturdays being from 10am-3am. When travelling by road from Madrid take the national highway N-1 toward Burgos and use exit 19. The number 156 bus to Plaza Norte 2 departs from Plaza de Castilla. Telephone 91 659 39 67 if you have any queries.